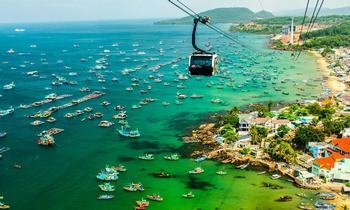 Phu Quoc is a beautiful island and a tourist attraction paradise. 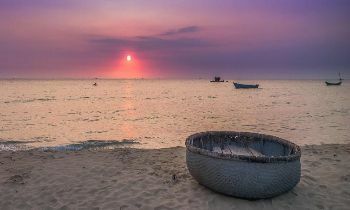 If you are planning the upcoming Phu Quoc trip but do not know where to start, how to go, etc. 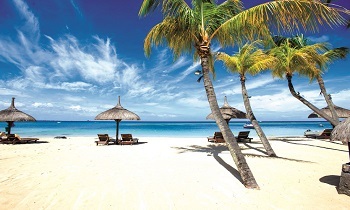 Let's take a look at the full Phu Quoc travel experiences below. 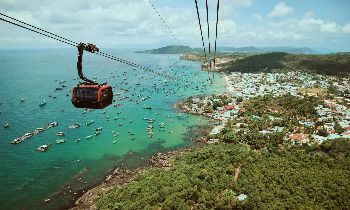 Phu Quoc is an island featuring forests, mountains, and sea with an area of ​​1320 square kilometers, a length of 48 kilometers from north to south, and a population of about 80,000 people. 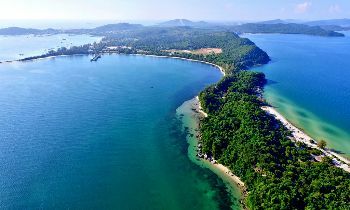 Phu Quoc island is located in the Gulf of Thailand which is 45 km west of Ha Tien. 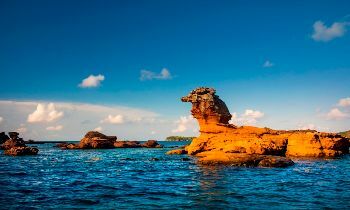 This is also the largest island in the Gulf of Thailand, Phu Quoc is actually closer to Cambodia—just 9 miles away—than to mainland Vietnam. Cambodia lays a competing claim to the island, which is why the Vietnamese keep a substantial military presence there. (Much of Phu Quoc, in fact, is off-limits to the public.) Stretching 30 miles, north to south, it is roughly the size of Singapore, but it has only 85,000 residents to Singapore’s 4.5 million. In 2001, nearly one-third of the island—including 35,000 acres of primeval forest—was designated a national park. 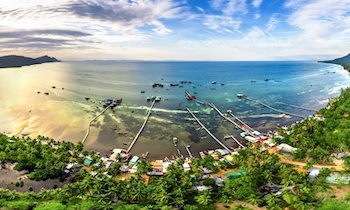 From the air, Phu Quoc registers as a bright-green paint drop, ringed by flecks of ivory, splashed on a turquoise canvas. People compare its shape to a conch shell. Others see a kingfish twisting its tail. Still others will say that Phu Quoc looks like a fat green wad of money. For if all goes according to the official plan, this quiet backwater could become the next Phuket. 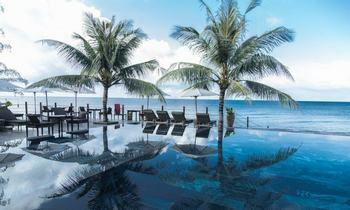 Distance of 15 km south of Cambodia, Phu Quoc owns the most beautiful beaches, and delicious seafood dishes. The mountain and forest system in Phu Quoc has created a wonderful resort with white sandy beaches and ancient fishing villages. 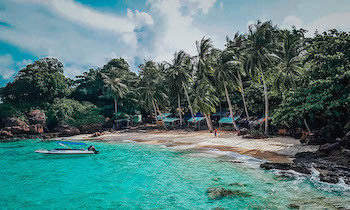 Phu Quoc is a tropical monsoon climate with two distinct seasons: dry season from November to April next year and the rainy season from May to October. 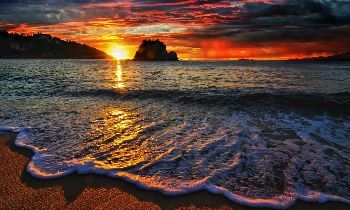 Therefore, when traveling to Phu Quoc, you can come at any time of the year, in which the best time to Phu Quoc is the dry season from October to March or last until May. 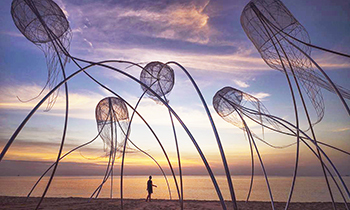 Ham Ninh fishing village with ancient features of the ancient fishing village is also an ideal place to watch the sunrise or sunset. There are many delicious seafood dishes you can enjoy or buy as gifts here. The sea water here is very clear and blue, it is possible to see a lot of fish swimming in the sea. Tranh stream tourist area is a must-visit destination in Phu Quoc in the middle of the green forest, creating a beautiful picture. However, if you go in the dry season, there will be no water in the stream, in contrast, the tourist resort is famous for its very good and sweet fruit, if you have the opportunity to visit, please enjoy it. Phu Quoc is famous for its spicy pepper gardens, with a distinct aroma different from other places. Here, you will admire the green pepper gardens and have the opportunity to keep beautiful photos of the beautiful pepper garden. To the South of Phu Quoc island, it is impossible not to visit Phu Quoc prison where it is the lively evidence recorded the painful but glorious history of Vietnam revolution. It is a meaningful place for those who want to explore Vietnam history, especially for young generations who was born after Vietnam war. Sao beach in Phu Quoc is famous for its fine white sandy beaches, clear sea water that can be seen at the bottom. 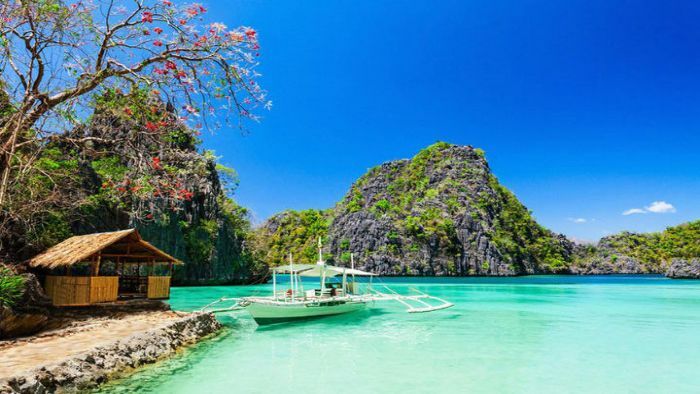 If you are a sea lover, you cannot ignore this location. Visiting Phu Quoc National Park to discover the interesting things in the forest, and enjoying the cool air and extremely rich and diverse botanical scenery. Diving and watching coral under the sea with beautiful coral reefs. Fishing on the sea is not only entertaining, but you can also enjoy your achievements right on the boat. Or go to the national park to experience ecotourism and explore famous islands such as Dam island, Ngu well, Ong Doi cape, etc. Phu Quoc is a famous tropical paradise in Vietnam that you should come to enjoy the real atmosphere of tropical sea region. If you need more information about Phu Quoc tours, don’t hesitate to contact us. Thank you!